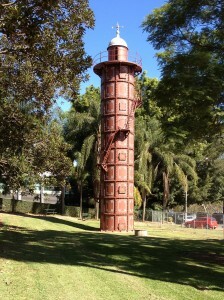 According to the article on “Your Brisbane: Past and Present” this is the Gas Stripping Tower used by the South Brisbane Gas & Light Company in 1912. It’s the only one of it’s kind left in Australia and it’s job was to “purify” the coal gas by stripping out ammonia and tar. Walking past, none of this is evident. The only signage appears to be on a small monument near the tower, but access to it, along with the tower is restricted by the relatively recent addition of the fence. It takes a walk along the fence line a reasonable distance from the tower to find out why access is restricted. It appears that a number of the huge fig trees have Phellinus noxius, a fungus that can kill large trees. The council, rightly so, is concerned that large branches or even the trees themselves may fall unexpectedly and so access has been restricted. What is disappointing is that none of this is obvious to the casual observer. It’s unfortunate that the Brisbane City Council hasn’t provided appropriate signage near the tower outlining the history of this unique and unusual piece of history, or the plight of the trees.